Over 1000 join Chicago International Women’s Day rally | Fight Back! Chicago, IL - Over 1000 people gathered at the headquarters of the Chicago Teachers Union (CTU) to celebrate International Women’s Day, March 8. 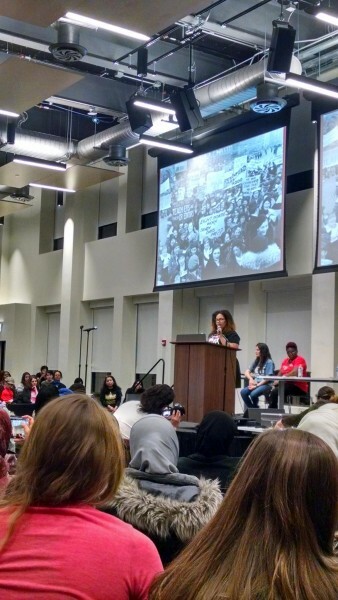 Speakers from CTU, Fight For 15, the teachers union at the Charter School Aspira, AFSCME and other unions shared the stage with Rasmea Odeh, along with Filipino, Iranian and undocumented immigrant women. Jazmine Salas from the Chicago Alliance Against Racist and Political Repression spoke about the women who have been the backbone of the movement against police crimes in Chicago. Here are excerpts from Salas’ speech to the crowd: “Thank you for allowing the Chicago Alliance the chance to speak tonight. It has been so moving to hear from other speakers and to feel the energy and emotion in this room. Solidarity is the only way that we will win. “As women, we live in constant fear of assault and harassment from men. As Black and Latina working class women, we have an added threat of state-sanctioned violence in the form of police brutality. We are familiar with the stories of Sandra Bland, Rekia Boyd, and Miriam Carey - all Black women killed at the hands of police. But there is a different struggle, as women of color, who face racism, sexism and the threat of sexual violence, and as women who are the backbone of our communities. “The struggle against police crimes has been waged for more than 50 years in Chicago. There are many forces that have stood with us in solidarity, including unions like the CTU and groups like the Arab American Action Network. But for most of those years, when young Blacks and Latinos have been murdered, tortured or wrongfully convicted by criminal cops, the families of the victims have been the backbone of the movement. And in most of these cases, it has been the women in these families that have fought these battles. “Women like Danolene Watts, whose teenage autistic son Stephon was killed by the Calumet Police five years ago. Armanda Shackleforth, whose son Gerald Reed still sits in prison after many years, having been tortured into confession. Bertha Escamilla, whose son Nick was tortured into confessing and then spent 15 years in prison. Anabel Perez, who has fought for 20 years for her son, Jaime Hauad. Ruth Peña, whose brother, Angel "Javi" Rodriguez was wrongfully convicted for murder by the gang crimes unit in Humboldt Park in the 1990s. “We have been sexually and physically assaulted, shot to death for exercising our rights or just existing, had our sons ripped from our lives, without our families ever seeing a ounce of justice. Where is accountability for the police?